An excellent movie ISO writer should be able to help you quickly burn your movie ISO image to blank discs easily for playback with your Blu-ray/DVD players. If you are in need of a movie ISO image writer to help you burn ISO image to blank discs, check out our recommendation of the Top 3 movie ISO writers you can use. 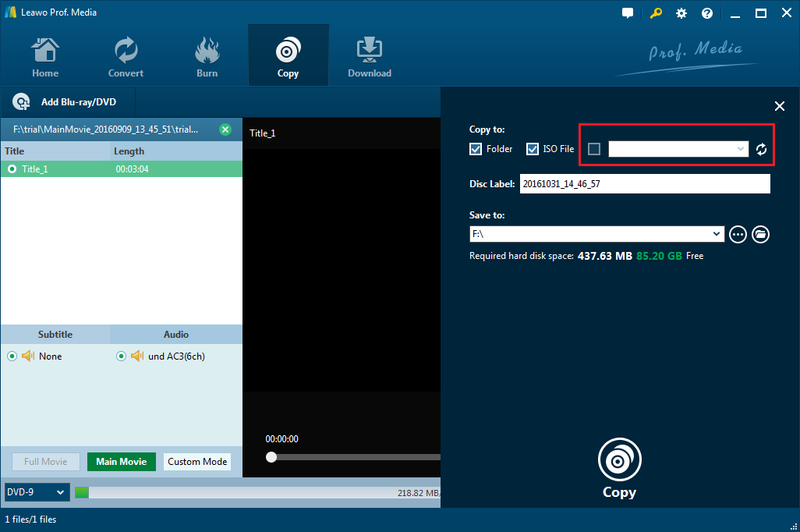 With powerful Blu-ray/DVD copying and ISO image burning features, Leawo Blu-ray Copy undoubtedly earns the spot for the No.1 ISO image writer. You can use it to burn Blu-ray/DVD ISO to blank Blu-ray/DVD discs with ease. Furthermore, It can help you extract ISO image from Blu-ray/DVDs and store the image file to your hard drive for future use like burning to a blank disc to create an exact copy of the original disc. 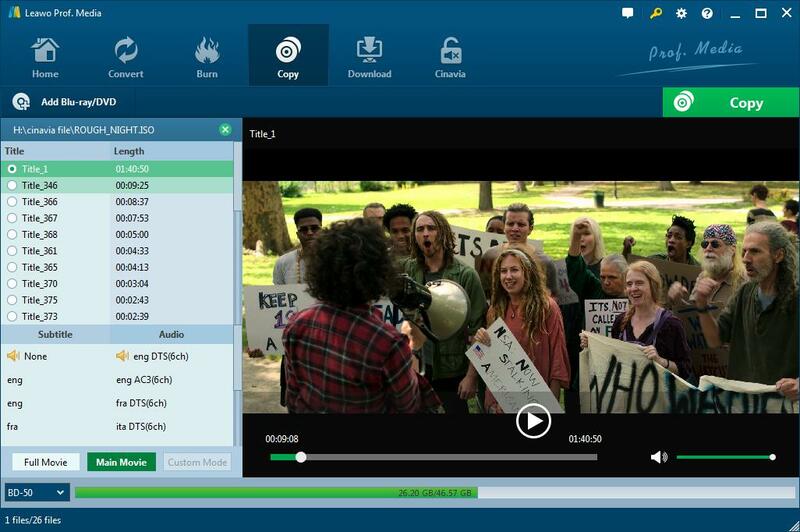 It’s an all-round Blu-ray/DVD backup tool that includes most of the features you could want in a Blu-ray/DVD copy program. You can use it to back up your Blu-ray disc to hard drive with nothing to worry about. 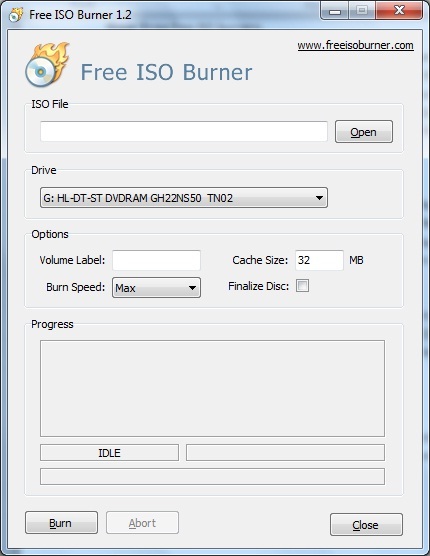 The Free ISO Burner is powerful regarding ISO burning features. You can use it to burn Blu-ray/DVD/CD ISO files to CD, DVD, HD DVD and Blu-ray disks. There are also some useful features like setting the disc volume, changing the burn cache size and setting the burning speed. It’s also simple enough to allow novices to master the program when using it for the first time. All in all, It’s a nice and free choice for an ISO writer program. 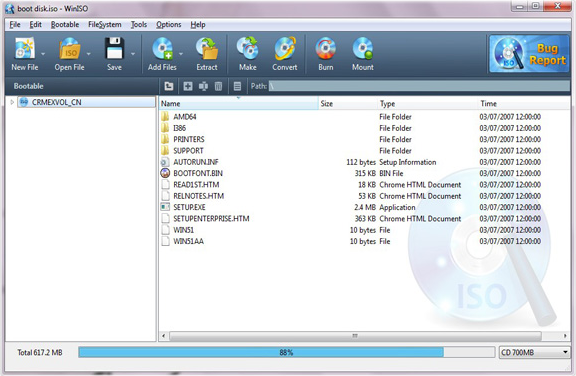 WinISO is also a wonderful choice for an ISO image burner as well as an ISO image extractor. It’s able to edit, make convert and burn ISO image on PC running different versions of Windows. You can also use it to extract ISO image from CD/DVD/Blu-ray discs or convert the CD/DVD/Blu-ray folders on your hard drive to ISO files. After getting a movie ISO file writer, you may start to give it a shot. Below I will show you how to use an ISO image writer to write ISO to blank discs. The program I’ll be using is Leawo Blu-ray Copy. ☉ Supports copying Blu-ray/DVD discs to computer hard drive and blank discs losslessy. ☉ Burns ISO images to blank discs. Note that unlike the other two ISO writers, Leawo Blu-ray Copy doesn’t function as a single program. It’s part of a software suite called Prof.Media. Leawo’s a renowned company for developing all kinds of high-quality media processing software and the company uses software suites to pack their best products to make media processing more convenient for their users. 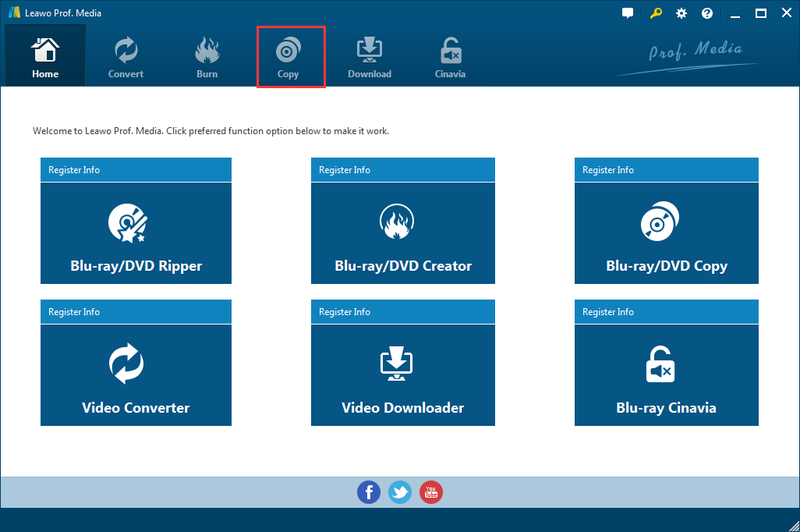 The shortcut to opening Blu-ray Copy is inside Leawo Prof.Media’s main interface. Just fire up Prof.Media and find Blu-ray Copy from the main interface. Click on it as you find it to launch Blu-ray Copy. 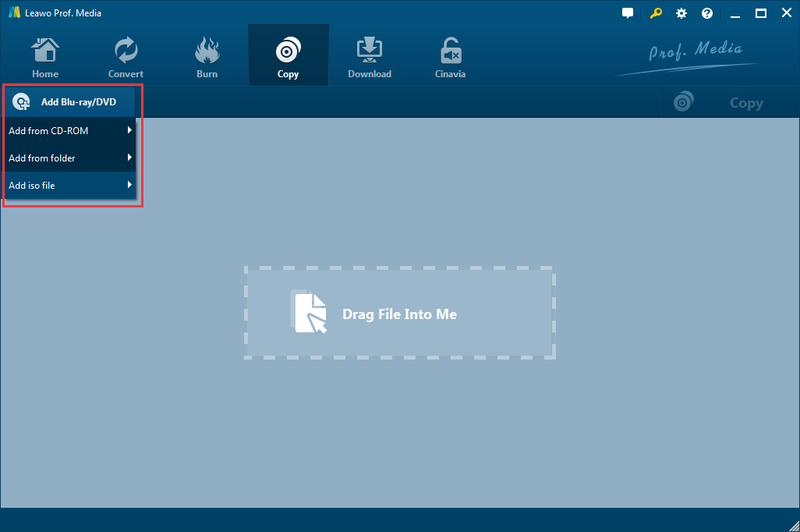 Drag the ISO file to the interface of Blu-ray Copy to import the file to the program. You can also try clicking the Add Blu-ray/DVD button and click Add ISO file to choose the ISO file from an Open popup window. Select different content in the ISO image to burn to the disc by using different copy mode buttons. You can use Full Movie to burn all the content in the ISO file to the disc. And choose Main Movie to burn the longest video in the ISO file to the blank disc. Also, if you want to choose the videos manually, check Custom Mode and select videos from the video list. Click on the button at the bottom of the left sidebar. It contains the option for choosing disc type for burning to the blank disc. You should choose a suitable one according to the disc you use. Enter the blank disc into your disc burner and click the Copy button atop the video player. Check the third option on the top of the following sidebar next to the ISO file option. If you have more than one disc drive connected to your computer, click on the drop-down menu of the third option and select the one with the blank disc drive. And then click the Copy button below to start writing the ISO image to the disc. As you can see, it’s really easy to get an ISO image burnt to a disc as long as you got the right ISO image writer program.